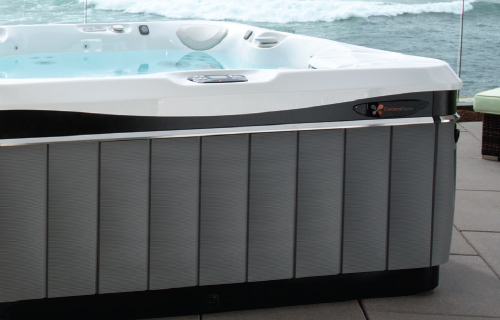 Many describe the Tahitian® hot tub as “just right.” Whether you are planning a party or looking to complement your workout routine, the Tahitian spa won’t disappoint. 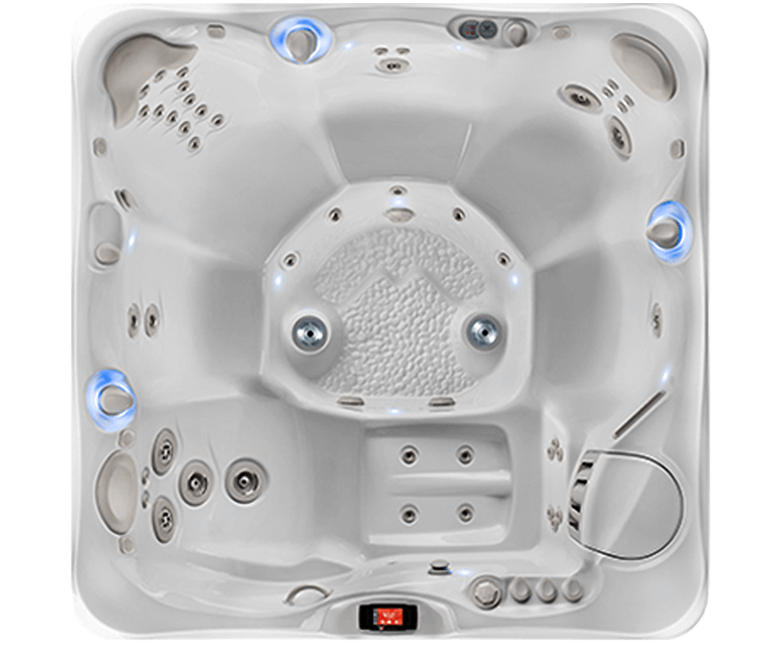 Relax in this model knowing that it’s loaded with hot tub features that you’ll enjoy day-in and day-out. To get the most out of your spa, it needs to operate at a consistently high level. 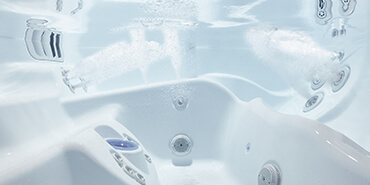 Each Caldera hot tub is engineered and built with the strictest attention to quality and efficiency. 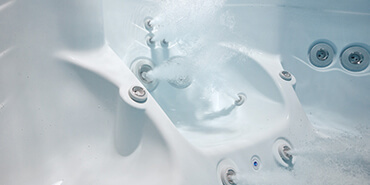 Our commitment is your assurance of reliable, energy-efficient performance for years of worry-free hot tubbing. 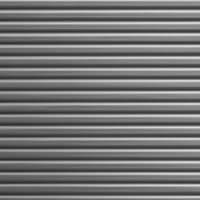 We’re committed to energy-efficient design as a way to save energy and save you money on operating costs. 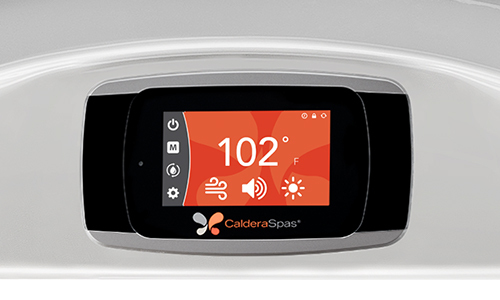 From our innovative FiberCor® cabinet insulation to our highly efficient EnergyPro® system to custom-fit covers, a Caldera spa meets the most stringent energy efficiency standards established for portable spas. And that saves you money. All water care systems require some attention and involvement, but some are far easier than others. With Caldera®, you have access to clean, healthy water without handling chemicals. With infrequent replacement of bromine and mineral cartridges, you can enjoy sparkling water whenever you’re ready for a soak. Your daily hydrotherapy experience is easily managed with our intuitive Advent control panel which gives you complete control over water temperature, jet systems and ambient lighting effects. Heaters, pumps and other components are designed so they’re more efficient, robust and longer-lasting. immune system, your social interactions and your health in general. The ability to fully let go, to completely power down, is so vitally important to your overall well-being. So, yes, we take comfort very seriously. hamstrings, calves and feet. Rotate through the circuit for total-body restoration or just concentrate on the areas that need the most attention. 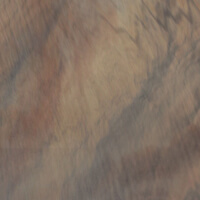 A Caldera spa is yours to personalize as you see fit. Our designers have created ergonomically sculpted seats that comfortably cradle you, decompress your spine and keep you aligned. Combined with the buoyancy of the water, the seat’s design releases pressure off parts of the body that are under force all day. Our seats are also designed in a way that help keep the water’s buoyancy from floating you out of the seat. After all, it’s hard to relax when you’re fighting the water to stay in place. 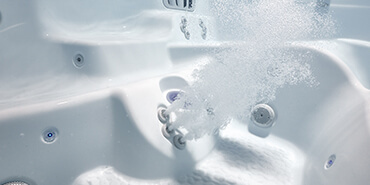 There’s also a Foot Ridge® unique to Caldera® spas that helps keep you stable in your seat even when the jets are at their highest setting. 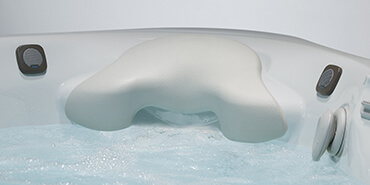 Comfort is the essential element in our hot tubs. Deep, cradling seats and a textured Foot Ridge® help you stay relaxed and seated even when enjoying powerful jets. 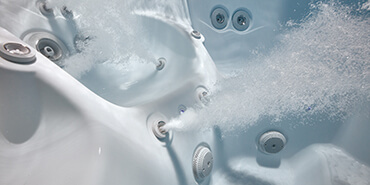 Perfectly positioned hydrotherapy massage melts your tension away. And a whisper-quiet sound dampening design enhances the comfort experience. A spa’s warm water massage promotes healing by increasing circulation, carrying nutrients to help cells and tissue regenerate. 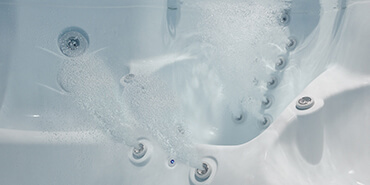 According to the textbook Comprehensive Aquatic Therapy by industry experts Dr. Bruce Becker and Dr. Andrew Cole, immersion in warm water is a “unique healing environment” that can lead to temporary relief from muscle aches and pains. 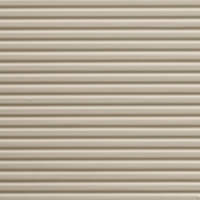 The immediate allure and beauty of the Utopia® Series comes from its Avante™ all-climate cabinetry. Avante is an amazing long-strand fiber technology that is so durable it resists rotting, and is warrantied not to crack, split, or chip. 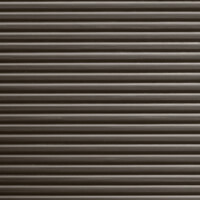 It’s a gleaming, high-strength material that gives the spa it’s contemporary look and fluid impression. The transformed Utopia design features a new vision of the spa shell design, one that’s minimal, elegant, and contemporary. 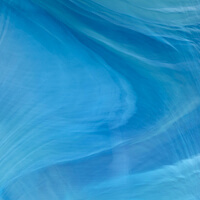 Its curved lines add to the spa’s beauty with an uplifting impression. 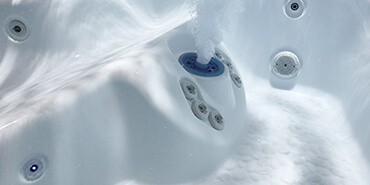 The Utopia® Series spas represent our most innovative approach to design, performance, and comfort with features that are simply unlike any other spa available today. With it’s stunning multi-dimensional Avante™ all-climate cabinet and elegant new shell design, the Utopia Series will captivate you. 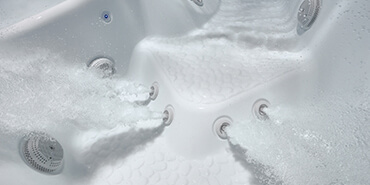 The SpaGlo system in our Utopia Series models includes six colors that accent individual zones throughout the spa. All the zone lighting is adjustable. We’ve enhanced the system with pin-point lighting that highlights selected areas of the spa, including the Euphoria® jets in the footwell of the Geneva®, Niagara® and Tahitian® models. In addition to their interior lighting, the Utopia Series models feature corner and perimeter lighting that intensifies the beauty of the area immediately surrounding your spa. 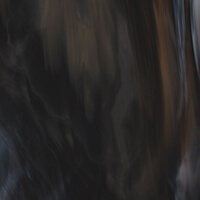 Music has the ability to enhance or create nearly any mood. 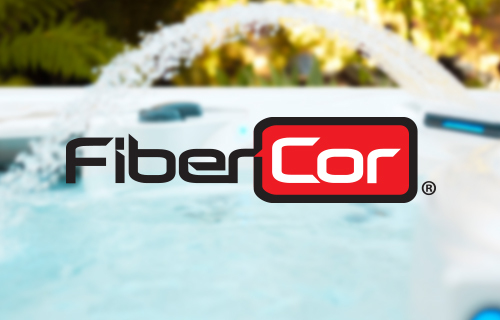 For the ideal setting in or around a hot tub, it’s important to have components designed to deliver high fidelity sound in a wet, outdoor environment. We offer a range of integrated music options so that you can find the entertainment system that works best for you. A contoured pillow cradles your head while specialized above-the-water-line jets focus on neck and shoulders. In Utopia® models they work on muscles in the lower leg. Anchors and holds you in place while powerful jets work on sore muscles!. Spa time in as part of my weekly routine to unwind after workouts as well as just relaxing in the evening. The spa design is perfect for my use. Absolutely a wonderful investment, The Tahitian has surpassed our expectations and we look forward to many years of trouble free use. I have enjoyed relaxing in my spa for years! It’s very comfortable and easy to use and care for! Perfect one on one time with my wife. Very relaxing and peaceful.